Showing results for tags 'atlantic'. 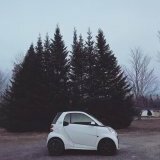 Hi All, i recently purchased a 2014 Smart Fortwo Electric Drive and curious if anyone else in NB has one, if so where do you get it serviced? I called Saint John Mercedes and they mentioned they were not currently set up to perform the recommended maintenance, so I'm thinking I may need to go to Quebec if Moncton and Halifax cannot service either.. Recommendations? Thanks!